It's Wednesday morning and we're getting ready for the rally stages that will be conducted on roads near Gorman, CA. attached to it. Last night the seeded draw was done and we pulled 9th on the rode. Followed up with a lovely dinner at the truck stop buffet. Highlight was having dinner with Tanner and Colin McCrae (SP.) joined us !! He's a great guy, very personable with a lovely Scottish accent. We talked about his passion for skiing. Tanner has really connected with Colin, in fact he got the opportunity to ride in his Sobe STi on one of the test runs yesterday and than proceeded to take him to he oval track at Irwindale to drift with Hulk Hogan's son. 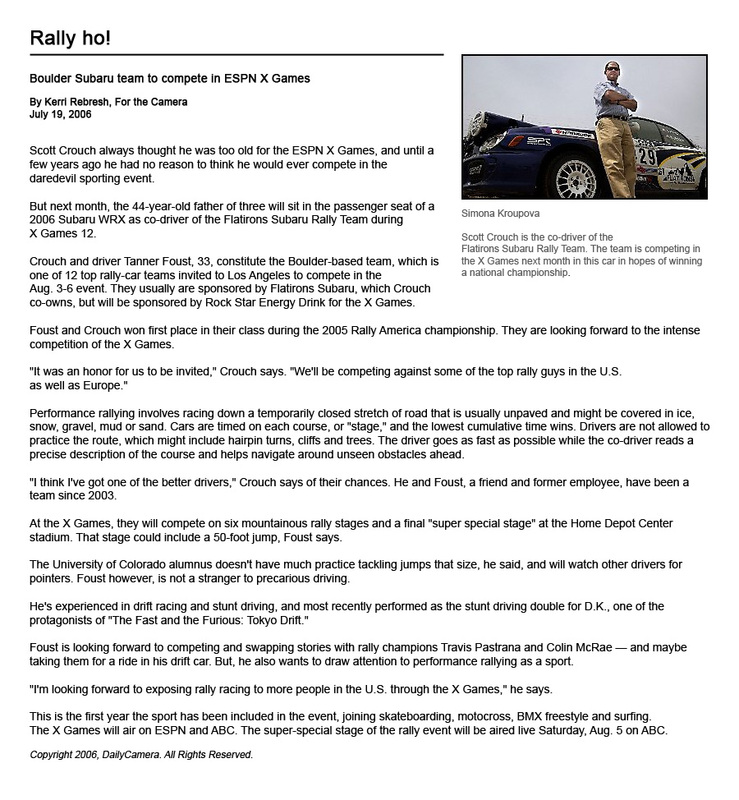 Tanner is the first human to drift and rally with Colin McCrae on the same day. While tanner was at the track I spent some time with Christian Edstrom and Alex Gelsomino Co-drivers for Pastrana and Block...great guys and we enjoyed sharing Co-Driver stories. The Subaru team is made up of a bunch of dedicated and passionate rally "nuts' and it has been a life's experience to be a part of it. Tanner and I have 3 dedicated techs and our lead tech Phil from the UK is constantly asking for feedback on the car and making sure everything is perfect. Excited for the stages today. Tanner and I were up late studying the notes... stages are for the most part very technical with many 2's and 1's should be a challenge for me staying up on the notes. But hey, this is the x-games we're in a Subaru and rock star energy drink sponsored, fully prepared STi and I am going to enjoy every minute of it! !